Spring is finally in the air! We've been able to spend plenty of time outdoors, which means the boys have been sleeping better from all the fresh air. Flowers are far from blooming, however, so I decided that we needed to bring some spring indoors. 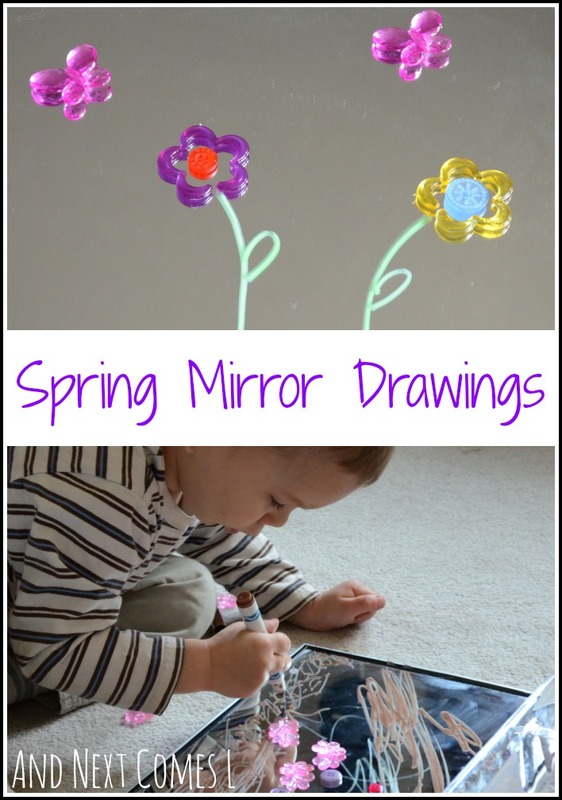 I set up a spring themed mirror activity for this month's Light & Reflections series post. Similar to this Valentine's mirror invitation, I set out our mirrors and some window markers. I chose green and brown window markers to reflect the earthy tones that are visible outdoors right now. I also set out some buttons, flower shaped plastic jewelry links from the dollar store, and some acrylic butterflies that I found at Michaels. When I originally set out the materials, I did set up the small scene that is in the first picture to inspire the boys. J immediately started to imitate it by strawing plant stems. He then added some extra butterflies, happily counting them as he added them one by one to the mirror. Of course, every spring scene needs some numbers. At least, in J's mind. So his spring scene was surrounded by random strings of numbers and a few addition sentences. He then drew some green grass. J's finished product is very pretty. I love the plants that he drew! I figured that K would just be interested in dumping the buttons over and over, but boy, was I ever wrong! I have never seen him into an activity like this, but he thoroughly enjoyed it. It was also the first time that I've seen him so interested in drawing and coloring. I especially loved how K would lean so close while he colored. He was so focused on what he wanted to draw and quite purposeful with his mark making. K eventually cleared off most of the loose parts from the mirror. His final picture doesn't look like much to others I'm sure, but I was so mesmerized by how focused he was on this activity that I am rather proud of his end product. 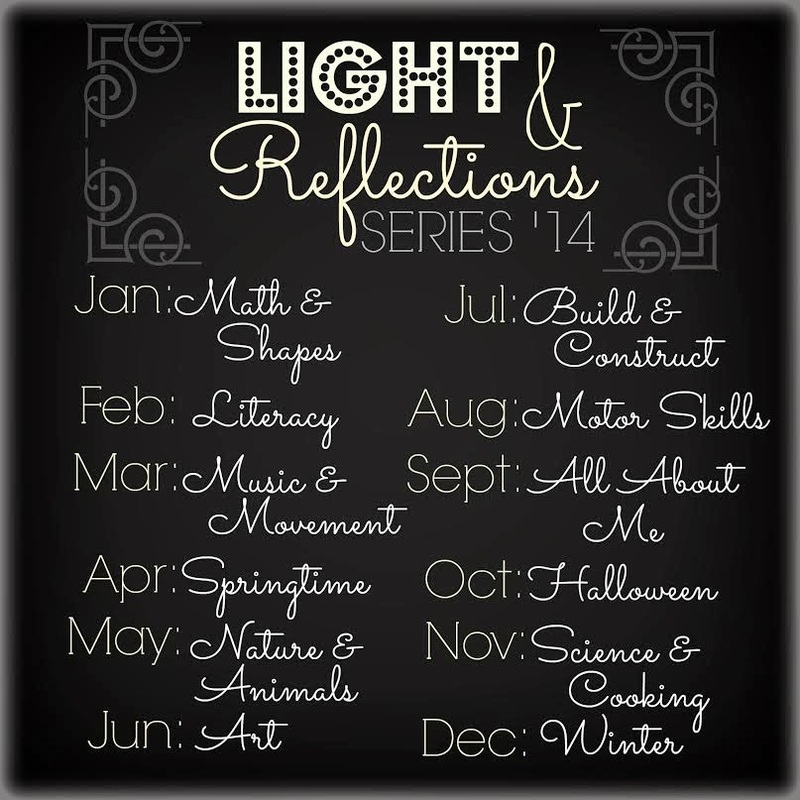 You can find all the posts from this series on the Light & Reflections Series board on Pinterest. Next month we'll be focusing on nature and animals. They both created amazing Spring drawings! Didn't they?! I thought they looked pretty great! So fun! I love the photos! They are so focused on their masterpieces! Thanks, Lisette! K sure was focused, wasn't he? Oh yes, you must! Window markers are our go to boredom buster around here! There's just something about mirrors and markers! Both always capture my boys' attention!